Something has shifted over the past few weeks and months. Since 2008, we have delivered six of these action learning programs in collaboration with our colleagues at UID (United In Diversity) in Indonesia, each with one module at MIT and another four modules in Indonesia. Each program is limited to about 35 participants. Sometimes the prototyping results have had significant impact. Sometimes they have provided more of a learning experience for the people involved instead. But in every instance we witnessed the activation of a profound collective field of co-creative energy that generated new ideas, new projects, and shared initiatives in subsequent years. Since almost all the teaching materials used in this MIT program are openly shared through MITx and edX.org, the open learning platform co-founded by MIT and Harvard, they can be used in contexts anywhere (with or without MIT’s supportive involvement). 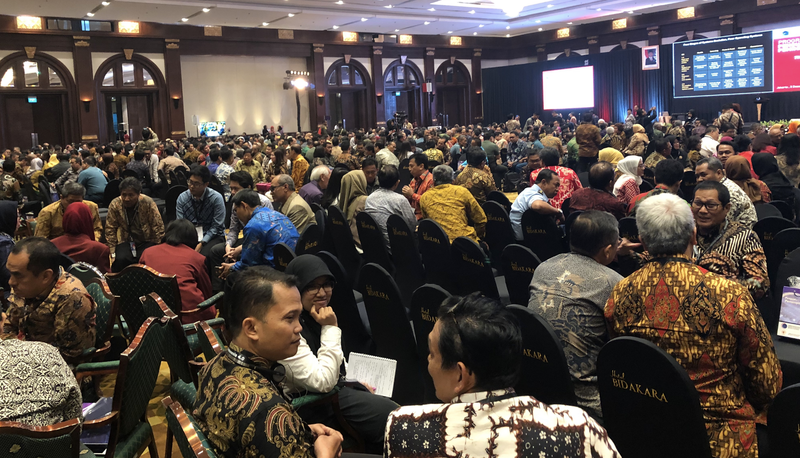 So far, the domestic replications of IDEAS type learning environments have given rise to several new system leadership labs inside various Indonesian NGOs, universities, banks, and companies, as well as the government. In other words, the systems leadership knowledge, which ten years ago was limited to MIT faculty, is now fully localized. One recent offshoot of the IDEAS program was sponsored by the Ministry of Manpower. When the President asked the minister about the decreased number of incidents regarding labor protests and conflicts, the minister credited, among other things, that action learning program. This led other Indonesian ministries to take up and adapt the system leadership approach in their own organizations. Currently, we are facilitating a program for the top 700 civil servants in the country, including ministers of the Indonesian cabinet (see picture below). I have just returned from the third session with those 700 government officials, plus leaders from business, media, and the civil society community. Although I believe the group may be large enough as is, our partners in the Indonesian cabinet disagree. It’s too small, they say. Therefore, in the coming years they want to replicate and democratize the whole-system learning environments for many thousands (or even “millions”, as they suggest) more. Over the past few months, my colleagues and I at the Presencing Institute have begun collaborating with the United Nations Development Operations Coordinating Office (UN DOCO) to accelerate the implementation of the Sustainable Development Goals (SDGs) in several countries. Our first two prototype projects, in Cambodia and Uganda, use the same set of methods and tools for systems leadership as outlined above and are off to a promising start. With these and other collaborative initiatives to be launched on a significantly larger scale next year, we hope to build a collective capacity for change at the level of the whole eco-system. The capacity for activating generative social fields among complex and often conflicting multi-stakeholder groups is at the core of all advanced leadership work today. One of the most inspiring projects that I have been engaged with for the past four years is MITx u.lab, which began as an online class via MITx and the edX platform. It has activated a worldwide eco-system of change makers who are using the tools of awareness-based systems change to bring about transformation in their own organizations around the world. 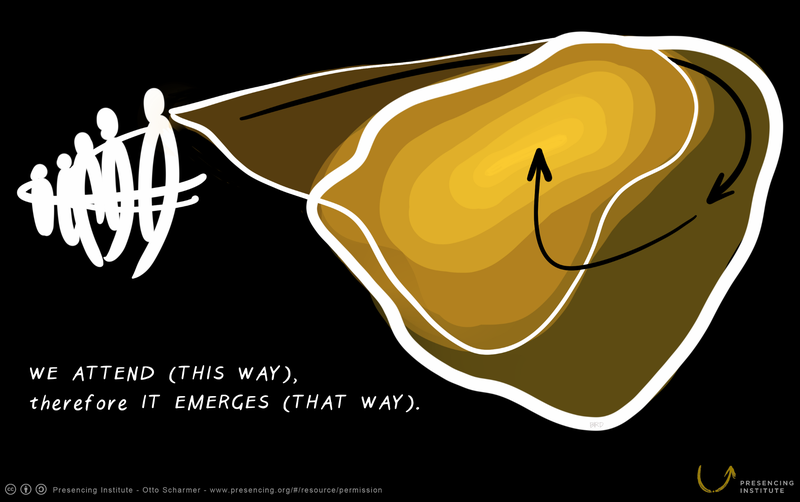 The methods and tools of awareness-based systems change help change makers to put these principles into practice. The u.lab is a free, online-to-offline infrastructure that radically democratizes access to these methods and tools. Since its launch in 2015, u.lab’s more than 120,000 registered users have formed hubs and communities in over 1,000 places. More than 30% of those who completed the u.lab journey said in an exit survey that it was a “life-changing” experience. That’s the upside. On the downside, we have always received requests to provide follow-up support as people begin launching their own initiatives, without having been able to provide such a structure. These requests have now led us to take our next step: offering the Societal Transformation Lab (STL). The Societal Transformation Lab will offer a multi-local innovation journey for teams that want to link up with a global movement of change makers that use the methods of awareness-based systems change. It will focus on societal transformation in specific areas: farm & food, finance, business, learning & leadership, health & well-being, cities, and democracy. The STL is free of charge, but teams must apply and be accepted. We had intended to launch the STL with 100 teams. But based on the 350 applications we have received to date we now anticipate accepting up to 250 teams. Each one is place-based. Many are part of well-established organizations. Others are grassroots groups that will bring their fresh ideas and collective energy to the Lab. 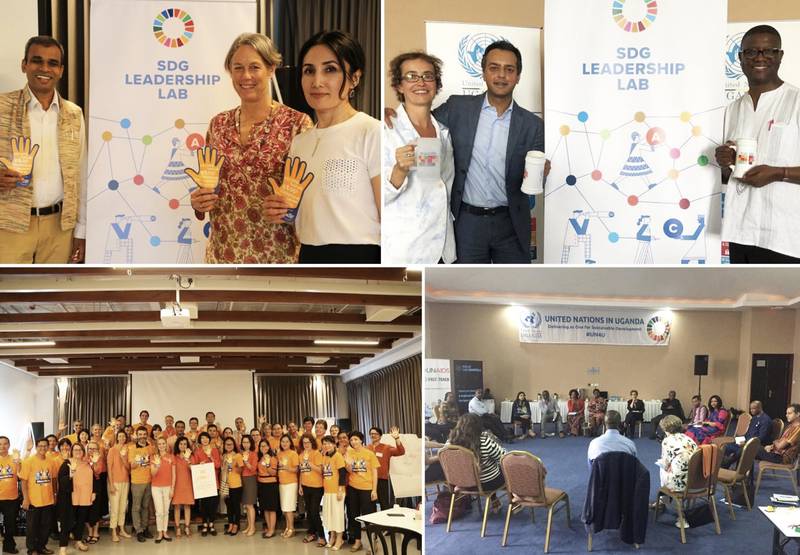 The Social Transformation Lab’s core group of co-convening organizations includes Ashoka, the BMW Foundation, the Dutch Board of Water Management, Impact Hubs, the League of Intrapreneurs, Policy Link, RSF Finance, Shambala, Teach for All, Triodos, several UN organizations, United In Diversity (UID), and WeAll. In February this global network of organizations and change makers will be fully activated in terms of a vibrant web of peer coaching and collaborative cross-team relationships, aiming to prototype new ways of pooling and leveraging shared resources and ways of operating across institutional boundaries. 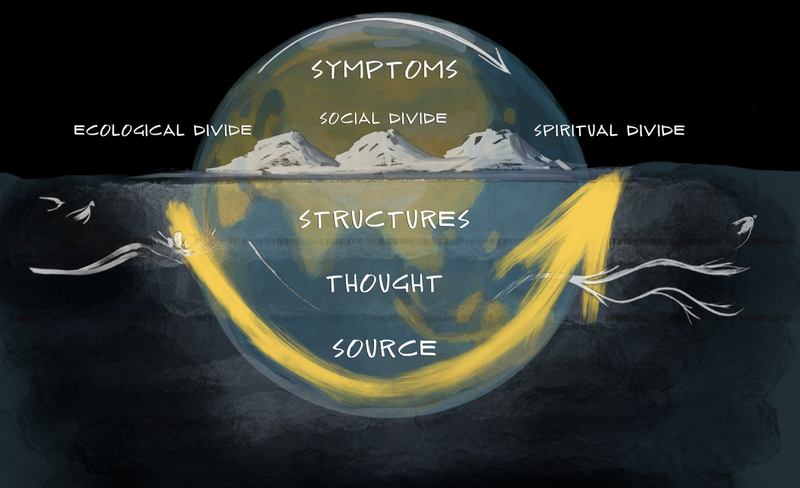 As always, the pathway and goal of this community will be to shift the mindset of people and organizations fromsilo to systems view — that is, from ego-system awareness to an eco-system awareness that is grounded in a shared intention of the future we want to create. Our Zambian colleague Martin Kalungu-Banda has taken the inspiration of u.lab and applied it to the area of the world that he cares about most: Africa. The vision of Ubuntu.Lab is to revive and regenerate systems in Africa by Africans, for Africans, and through Africans. Ubuntu.Lab is rooted in the methods and tools of awareness-based systems change, with the addition of the Ubuntu spirit and flavor in particular: I am because you are. 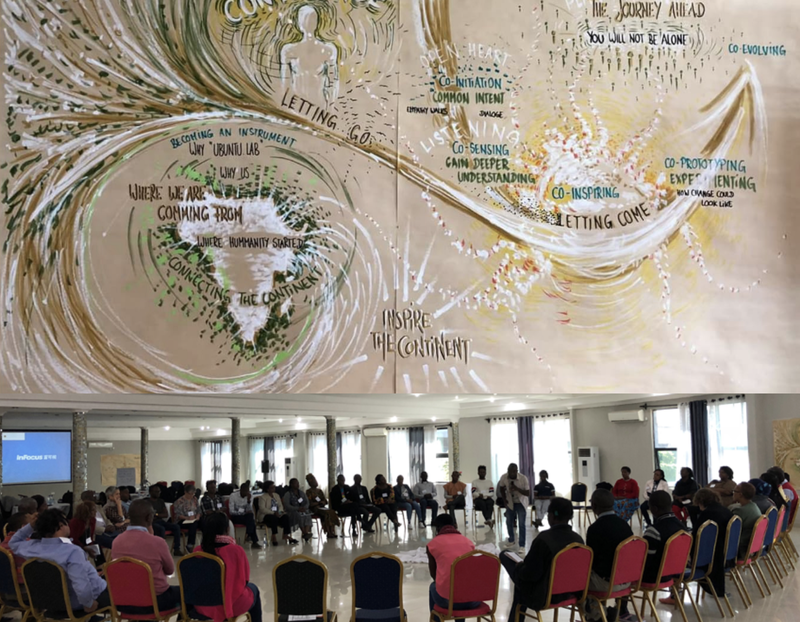 The picture above shows the graphic recording from the first cohort of Ubuntu.Lab, launched in the second half of 2018 with 300 participants from 18 countries. The graduates of the first Ubuntu Lab in 2018 are now the core team that prepare the next delivery in 2019. Perhaps what inspires me most is the prospect of connecting and interweaving all of these stories and networks for profound change. I think of it as a university campus 2.0. This new type of campus would not be closed, but open to the various eco-systems of profound societal renewal. It would breathe together with these networks for change and allow the next generation of change makers to join and apprentice in these various hotspots of profound societal renewal. It would be co-shaped in partnerships between pioneers and co-faculty who reinvent and advance the current forms of education, democracy, finance, government, and business. 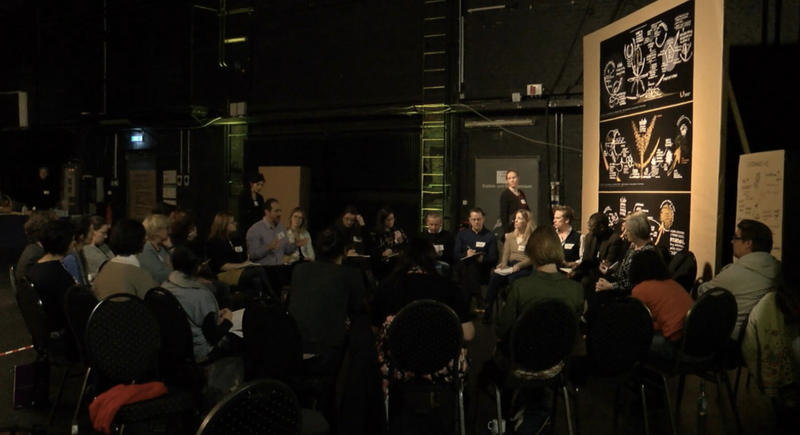 Last week in Berlin, at the closing event for the u.lab 2018 on the Berlin Tempelhof BUFA Campus, we took a big step in that direction. Soon, the Berlin Tempelhof BUFA Campus will open as a regionally grounded and globally connected hub for societal transformation (we are planning a Global Forum on the Tempelhof Campus for November 14–15, 2019). What is needed today? And what are the axial coordinates that we need to shift from their old mode (20th century) to an emerging new one (21st century)? 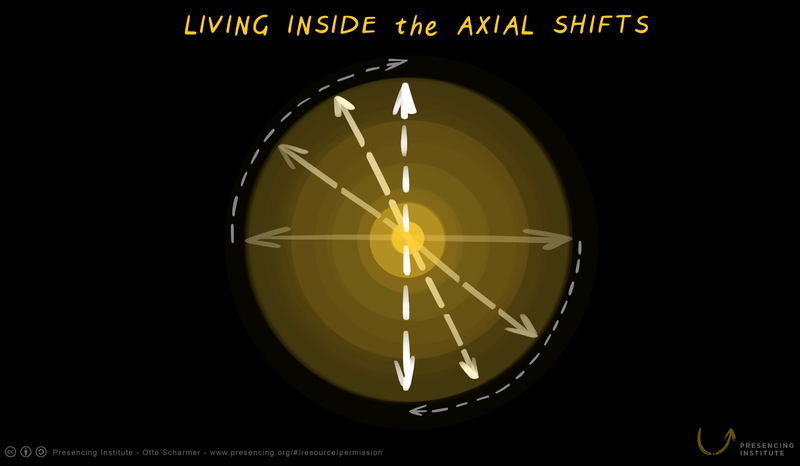 What does it mean to live inside these axial shifts? The bottom line of these three axial shifts is the same: while the old discourse (left vs. right, government vs. markets, etc.) has been a question of difference in ideology, the new discourse appears to be a question of difference in consciousness; that is, of ego-system awareness on the one hand and eco-system awareness on the other hand. In a practical way, the developmental need in all western and non-western societies that I have been working in over the years (including China) can be summarized as: the need to build collective capacity for vertical development across all relevant societal institutions — i.e. the capacity to move from the lower two to the upper two quadrants in the above depictions of the axial shifts.